The town’s hermit monk walked down the hill from the highway and waited patiently (which I guess is something hermit monks are good at) while I got this shot. Then we had a chat. As you do with hermit monks, I guess. 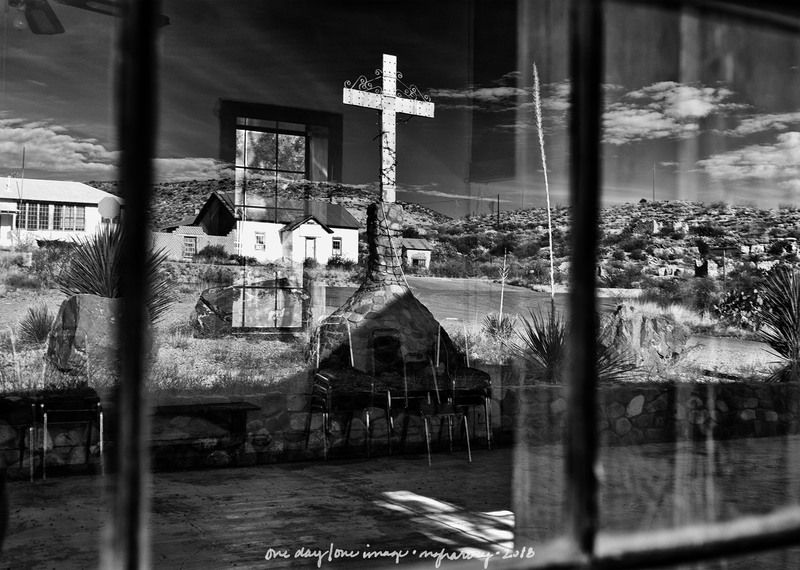 Posted on December 24, 2018, in Photography and tagged 365 photo project, black and white photography, church, learning to see, Leica, melinda green harvey, monochrome, one day one image, photo a day, photography, postaday, reflections, road trip, shafter, shafter texas, texas, thoughtful seeing, travel photography. Bookmark the permalink. 7 Comments. Great reflections, monk or no monk…..
Glad he didn’t impede your artistic impulses. Happy Holidays. He was very patient about waiting on me. I guess hermit monks who paint Russian-style icons are used to being still and waiting. Nice one. Love the rich tones. Thanks, Frank. I appreciate your commenting on the post!